Golden in color petrified Palm wood is the state stone of Texas, it has a designer cabochons like polka dot and have darker shades or black. A renowned brand of contemporary jewelry, Virtue London launches a fresh range of silver bangles as a part of its recollection series. After trailing the new creation at spring fair and IJL, Virtue London launched its new bangles into stores on 3rd December 2015. The bangles have been crafted in sterling silver and valued stones. Virtue London has launched a fresh range of sterling silver bangles that are 18 in total as a part of its Keepsake range on 3rd December 2015. The bangles are manufactured in metal cut out patterns with the embellishment of precious gemstones. The range is introduced as a trail after the launch of new products at Spring Fair and IJL. 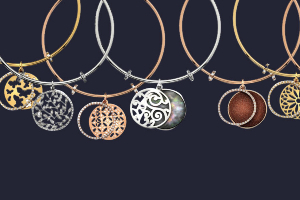 The beautiful recollection series (sterling silver bangles) spotlight one or more discs alike to those in the Keepsake series. Virtue London’s brand director Harriet Thacker supports the new launch by explaining that the company develops as per the market demand, and their retailers feedback, as retailers are the one who personally deals with the customers and their likings. Further, the brand has determined to use the exhibitions to know the market movement in addition to valuable feedbacks from their retailers to craft the worthwhile and in-trend range of bracelets. Most of the bangles showcase two discs that fashion a layered look of the gems along with the patterns that Keepsake buyers desire. Virtue London’s stockists who attended the exhibition were presented the initial set of the sample in February and in September the revised set, to take the feedback on designs and quality, for the point of sales. The final selection will feature bangles in gold, rose gold and silver.